Ocean Walk E-14 is a two bedroom two bathroom, comfortably updated condo. Large living room with large flat screened TV. There is a patio off of the living room. The kitchen has been completely update along with new flooring. Master bedroom features a queen bed and guest room has a double bed. So much to do, fish in the lake or feed the ducks. Play basketball, or swing at the playground, or have a good work out in the exercise room that over looks the lake. Ocean Walk is a short walk to the pier where crabbing is always fun. Build sand castles or fly kites at the beach. You can ride bikes over the entire Island. Come stay with us and fall in love with St. Simons and Ocean Walk. 0.9 Miles to the Village, Beach and Pier. This is our second year staying March and April we enjoy the condo and the area. The only problem is the master bedroom TV does not work. We are booked for these two months next year and I would like to see it replaced or fixed which has already been looked at by management and they were unsuccessful. Nice Rental spot & great Company. Close to local shops & restaurants. We enjoyed our visit and the condo was very pleasant. Going back next year for 2 months maybe three if it becomes available. My daughter and grandchildren came for a long weekend vacation and my place was too small for everyone. The Ocean Wave condo was a great alternative. We were near everything we wanted to do, and had the space we needed to enjoy their visit. Everything we needed for the kitchen was provided and it was great to have the washer and dryer for beach clothes and towels. Loved the decor and the comfort of the furniture. Well go back to this alternative whenever we have our families visit in the future! The only reason the condo did not receive a full 5 stars was due to a message I received two weeks prior to our arrival. Posted on the website was the fact that this condo accommodation would house only 4 guests. It was originally posted that it would house 6 guests due to a pull out couch. No concessions were made due to this change. Otherwise perfect location, charming condo. Great location and close to everything on the island. We found our stay to be very pleasant and in fact have booked an accommodation for next year at one of your other facilities. Jan and her staff were excellent to work with and go highly recommended. If you can't stay on the beach, this is the next best thing. It is very affordable. The units are comfortable. The property is very well-kept, and it is located near the village. We enjoyed bike riding and the beach the best. I had an excellent experience renting form Real Escapes. The staff was extremely accomodating, knowledgible about the availible properties and very friendly. The property that we rented was like a home away from home. 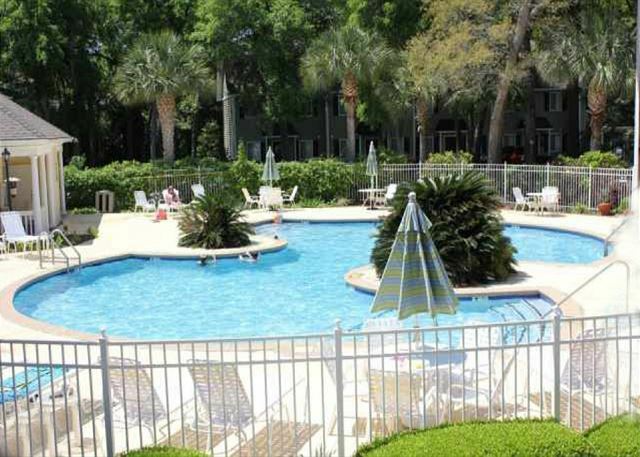 Our overall stay was just what we were looking for in a St. Simons Island vacation. We'll tell our friends about Real Escapes and E-14. This was our third year at Ocean Walk and we have enjoyed the location very much. The real estate company has always been very helpful if anything goes wrong. We have recommended this location to friends and family and this created them also booking this location.